“I joined the trip of May 2016 with a group from Ontmoet Palestina. For me it was a last minute decision but everything was arranged and I had a very special and valuable journey. During a 10-day trip, including four days at the Tent of Nations, I met a lot of inspiring people that deal with their daily struggles in a non-violent way. Their actions, mindset and thoughts have become an endless source of inspiration for me to take action and create awareness about the fate of Palestinians in the West Bank, and to watch the news critically. The approach of Ontmoet Palestina is: see, experience and share the word! 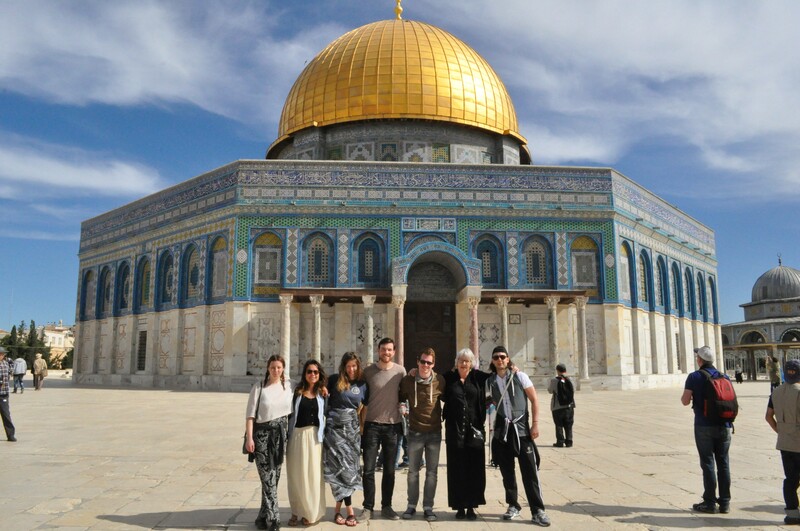 The group travel is especially recommended to young people, but is also a recommendation for older people: Meet Palestinians with the organization Ontmoet Palestina! "I have already made a lot of nice trips, but this was an unforgettable experience that I still think of very often! For ten days we travelled with a very nice group of people through Palestine. We have seen and experienced a lot. Among many other places, we went to Jerusalem, Nablus, Bethlehem, Jericho and Hebron. The guides know Palestine well and have shared their knowledge with us and have put us in contact with their many Palestinian friends whom they met during their previous trips. During coffee or a delicious dinner, we have heard many personal stories about how Palestinians, young and old, experience their lives and occupation. It is enriching to get to know the different perspectives, and we have seen with our own eyes the daily struggle of the occupation; the many checkpoints, the roadblocks, the separation wall, random harassment and much more. Many people invited us home for a cup of tea or lunch and the hospitality was great everywhere. We have had guided tours in a refugee camp and Bedouin village and we have visited various organizations that realize wonderful initiatives to get various groups in society closer together. During our trip through Palestine, the Tent of Nations of the Nassar family was home for a few days. A beautiful and special place! The Nassars are Palestinians who have made an international peace initiative of their farm south of Bethlehem, under the motto: "We refuse to be enemies." Here we have also worked two days on the farm while enjoying the sun. In addition to all these impressive experiences, there was also time for relaxing and fun: we got to know the Palestinian cuisine, learn to dance the dabka, enjoyed the view in the mountains of Nablus at night, shopped in various souks and swam in the Dead Sea . The tour guides are very open-minded, they create a good and relaxed atmosphere and made easy contact with everyone we encountered on our adventure. They know the security situation in Palestine and can properly assess situations. It was a rather troubled period in Palestine when we were there, but I did not feel unsafe for a moment with them as tour guides even in Hebron. Palestine and the Palestinians I have met during the trip will stay in my heart. I continued to learn about the country and have already returned again. And I hope to go again soon! "